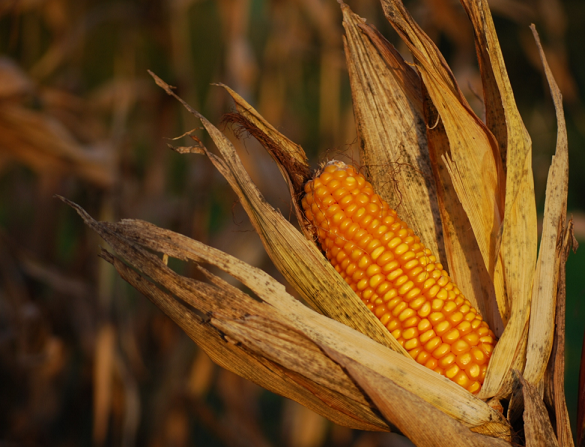 We take a look at a report published by Statistics South Africa which aims to measure the extent of South Africa's food security. Food security has become a hot topic ever since the expropriation of land without compensation hit news headlines as the public, markets and rest of the world wonders if policies such as expropriation without compensation will lead to a decline in farming activity in South Africa and therefore its food security. The introduction into food security and its measurement below comes directly from the report published by Statistics South Africa. "Issues of household food and nutrition security have received increasing worldwide attention recently as the impact of climate change and tough economic conditions puts new and additional stress on food systems. A report by Food and Agriculture Organisation (FAO) (in collaboration with FAD et al, 2018) warned that the world is not on track to eradicate hunger by 2030 as envisioned in the Sustainable Development Goals (SDGs). Recent evidence indicates that approximately 821 million people in the world were undernourished in 2017 (FAO, IFAD, UNICEF, WFP and WHO, 2018). Furthermore, the Global Hunger Index showed that 52 out of 119 countries had GHI scores, rated as having either “serious”, ”alarming”, or ”extremely alarming” hunger in the same year (IFPRI,2017). Ultimately, more and more countries are recognizing the need to expand the measurement of food and nutrition security and its importance in informing planning and monitoring of progress towards achieving the 2030 targets. Significant efforts have been made by the South African government to promote food security and to domesticate international indicators on food security to monitor development in different organs of the State. An inter-ministerial National Food Security and Nutrition Plan has been developed by the SA government and its coordination occurs at the Presidency. Additionally, the country’s National Development Plan (NDP) recognises agricultural productivity and rural development among the essential priorities for creation of employment, economic growth, reducing poverty and addressing food security in South Africa. The right to food is enshrined in the South African Constitution. Section 27(1) (b) of the Constitution of the Republic of South Africa states that, “everyone has the right to sufficient food and water” and Section (27) (b) emphasises that “the State must formulate reasonable legislative efforts and take other measures within its available resources, to achieve the progressive realisation of these rights.” The right to food requires that food be available, accessible, and adequate for everyone without discrimination. The Department of Agriculture, Forestry and Fisheries (DAFF) is responsible for developing agricultural policies and initiate support programmes to ensure that South Africans are able to produce their own food and reduce food insecurity. The Food and Nutrition Security Policy is key in achieving the objectives of the National Development Plan and that of the global SDGs. Goal 2 of the SDGs commits to ending hunger, achieving food security, improved nutrition, and promote sustainable agriculture by 2030. Thus collection, processing and analysis of data on food and nutrition security has become more critical to study the impact of, and to inform decisions on government initiatives towards reducing food and nutrition insecurity in South Africa. Since the concept of food security is broad, this therefore makes its measurement complex. According to the FAO, food security exists when all people at all times have physical, social and economic access to sufficient, safe and nutritious food to meet their dietary needs and food preferences for an active and health life. " This report is the first of a series of reports to be compiled by Statistics South Africa (Stats SA) towards shedding greater light on the state of food and nutrition security in South Africa. It seeks to provide information on the extent of households’ experiences of hunger and access to food, as well as to provide insight on the location and the profile of households that are food insecure in terms of access to food and exposure to hunger. The report also provides insight on the extent of households’ involvement in agricultural activities. The image below shows the proportion of South Africa's population living below the food poverty line (as calculated by Stats SA). See more regarding poverty in South Africa here. The image below shows the proportion of the population in each province involved in some form of agricultural activity (for own consumption or as a means of making a living). The image below clearly shows that less and less households are actively involved in agricultural activity. According to the report "Between 2011 and 2016, South Africa experienced a decline in the proportion of households involved in agricultural activities. In 2011, about 2,9 million households (19,9%) reported that they were involved in agricultural activities and in 2016, this declined to 2,3 million households (13,8%). A decrease of 6,1 percentage points was observed. However the decrease in households’ agricultural production occurred in all provinces." The pie chart below shows of all households involved in agricultural activities what percentage resides on which province in South Africa. 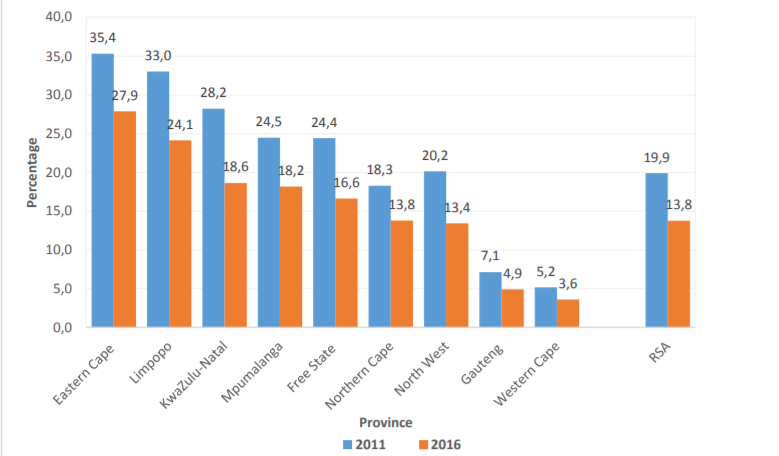 The province with the smallest percentage of households involved in the agriculture was the Northern Cape, followed closely by the Western Cape and then the North West. The report states the following regarding the pie chart above. "provinces that are predominantly rural and with high levels of poverty such as Limpopo (25%), Eastern Cape (20%) and KwaZulu-Natal (20%) had the highest proportions of households involved in agricultural activities. " 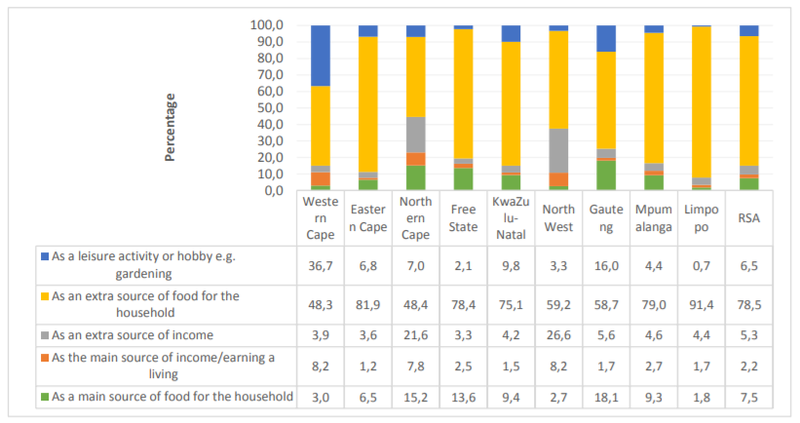 The stacked bar chart below shows the main reasons households are involved in agriculture and its broken down per province. So why are households involved in agricultural activities, is it for leisure, as main source of income, as an extra source of income, or even more worrying is agricultural activities the main source of their food. So for South Africa as a whole, 7.5% of households involved in agricultural activities stated they are involved in it as it is their main source of food. That is a clear indication of some of the absolute poverty that is prevelent in South Africa.